Congratulations, your first 14 days have been navigated and if you are still with me, I hope you feel proud. I certainly am as I do have a tendency to get excited about things and then find my energy wanes like the full moon. Still I knew that this was important to me and my future healthy, happiness and well-being, so it mattered/matters. This final week of our 21 Day Challenge is now focusing on another 7 days of repetition – you know the rules by now! Although it’s also about deepening our knowledge about how our thoughts can be anchored in such a way that the new norm we are creating is more likely to embed itself in our brains and become the new conditioning. 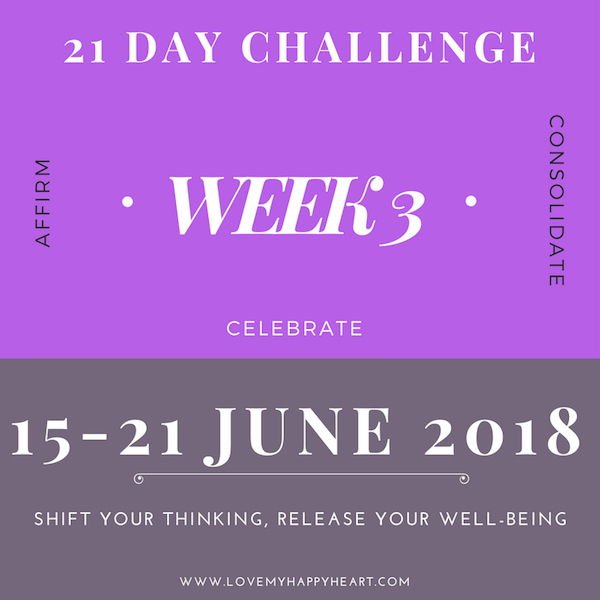 This week’s themes are very clear as we stumble or glide as the case may be towards the finish line – or the starting line depending on how you see it of course! As I heard someone say the other day; ‘Whilst you’re deciding whether it’s a cup half full or empty, I’m drinking it.’ I thought that was quite apt. 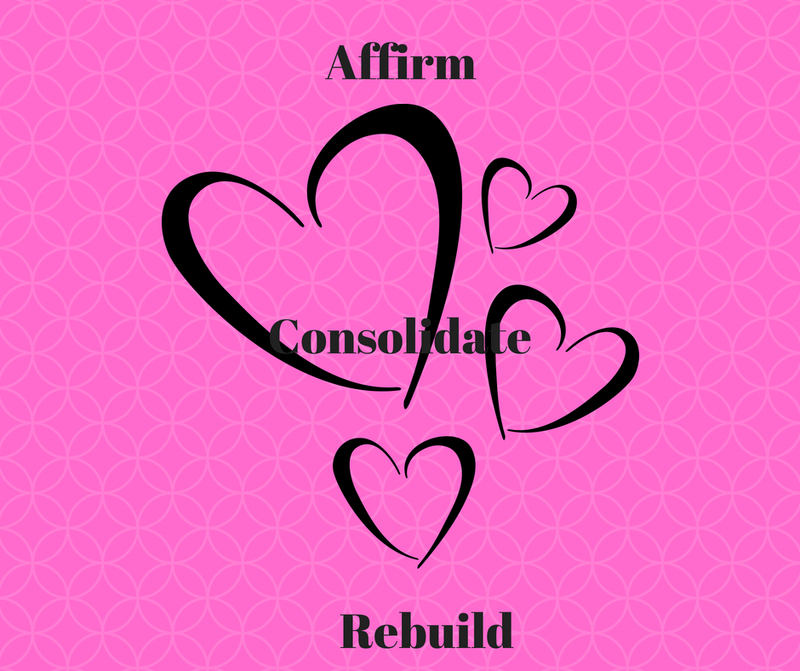 As we know move into this final consolidating phase we can really begin to embed our positive thoughts and use that depth to truly affirm the power of our new way of thinking. Your shift has already happened by just being part of this process although it is about to get a whole heap more powerful in this next 7 days, so hold your horses and get ready for a final burst of energy. The first of the two exercises I have for you today is taking your personal affirmations onto the next step, deepening their value and meaning. Tony Robbins taught me this and showed me how to take affirmations down to a whole new level and I have a huge amount of gratitude for his inspirations. He uses the idea of thoughts being like tables in a restaurant. The table tops (the thoughts) are nothing without the legs. They are simply planks of wood (words). We turn those words into something meaningful by attaching evidence and proof to them, hence turning them into conditioned thoughts. We nearly always do this unconsciously, our conditioning being reinforced by, yes you’ve guessed it, repetition. Yet in this example the reinforcement is negative and so our thoughts take on a demonic type of energy. This proof or evidence are the table legs and we irrationally build up examples that we think stabilises our view of the world. For this Challenge’s purpose, we’ll focus on the positive table tops that you have already created and give them legs as this will strengthen the neural pathways that you have already started to design in your brain map. The negative tables are for another time. My theory for now is that if we put our energy into creating new and positive pathways, the old ones will dissolve because they are not being utilised. As you might see from these anchors, as I like to call them, they start to give my affirmation more substance and definition. There is less chance for my ego to say ‘Well yes but…’ They are facts and clear evidence that has not been created by suggestion or my mind – they are real. So for your examples, start to add robust examples of truth of how and why your affirmation is certain. The more certainty we had the more power they have in our neural pathways. Take whatever time you need to today to do this as it matters to the process. The second exercise I would like you to engage in during the week, not necessarily daily, unless you can. If so then all the better. At least three times this week, I would like you to commit to a meditation. Science has proved that meditation changes the chemicals in the brain in a positive way and so as we consolidate our practice I would like to now introduce this to you using this set of guidelines. Choose a time of day that feels the safest and best time for you to have some ‘quiet time’. Find somewhere where you can be comfortable and undisturbed for 10 minutes. Make sure you are wearing loose clothing. Close your eyes as you settle yourself in the meditation. And start to breath consciously. Deepen your breaths and become aware of your breath in and breath out. Do this three times more deeply than before. Relax your body from your head through to your toes by placing attention on each area and allow your breath to return to a normal flow. If thoughts come up into your mind, simply allow them to float off into the sky like balloons and return to focusing on your breath. Now recall that visualisation you created last week and take a couple of moments to replay that movie, giving it all the detail that gives it power. Enjoy this moment and breathe through it. Allow the movie to fade and now repeat each of your three personally created affirmations, three times each. Say them slowly and see the evidence bullet points that you wrote earlier. Allow the affirmations to sink deeply into your body, down to your feet and out to the ground. Feel them spread like roots through the earth. And now become aware again of your breath, deepening for three rounds of in-breath and out-breath. Bring your focus and awareness back into the room listening the to noises around you. Slowly open your eyes and allow them to adjust to the light around you. Take a couple of moments to re-engage with your surroundings knowing that the 10 minutes you have invested has deeply earthed your affirmations and their evidence into your mind and body. Repeat the affirmations from week 1 and week 2 knowing that have for your own personalised statements a degree of certainty anchored to them. Do a meditation each day if you can. Journalise your experiences at the end of each day and note down how you are feeling especially now you have the additional strength to your new thoughts. On the last day of this week and the last day of the official Challenge, please do all the other exercises and also do a final review of how the week has gone. Notice how you feel, how the statements have felt during the course of the week and any changes, however small they might be. Congratulations on completing Week 3 of our 21 Day Challenge. It’s not too late to come over and join us at Wake up to Happiness if you wish and share your experiences and get that all important support. So you thought it was all over eh? Well almost we are. Having gone through and navigated brilliantly through this challenge, I would firstly like to congratulate you on what you have achieved. However great or small the shift, a shift is a shift in my book. Undoubtedly there were ups and downs along the way and times when you nearly gave up. I know it was like that for me too. Although now having completed the exercise, the final step is to think back to your original intention and look at how close you are to having achieved that. Has it met expectations, exceeded or fallen short? Don’t judge it whatever the outcome, just accept it the way it is. Review the process you went through and realise that you have followed a process that can be done as regularly as you need it and on different areas that cause you thought challenge. Do let me know how it has gone for you. Remember I designed this process for me first and foremost and so there will always be tweaks that we can create to something like this. I’m just happy to have shared my inspiration and trust it was what it needed to be for you. In terms of next steps – well there are a couple. Perhaps this has inspired you to read more around this subject. Why not check out Tony Robbins, ‘The Giant Within’ or any of the series of books written by David Hamilton. His latest release is ‘I Heart Me’, which is still on my reading to do list. Joe Dispenza also has some great material on this too. Perhaps you feel like you want to take this deeper? May be some coaching with me might be helpful or another talking therapy such as Emotional Freedom Technique or Cognitive Behaviour Therapy. If you google each of these, you can find a practitioner close to your community or even consider a virtual conversation. Or perhaps this simply didn’t work for you and that’s ok too. The key to personal development is to experiment with different techniques until you find one that truly resonates with you. So however it may be for you at this end of the Challenge, I hope you have found it interesting at least. As a coach with over twenty years experience, I have certainly seen the benefits. Of course this isn’t a guaranteed solution for depression or any other mental health issues and I would encourage you to seek out the support of your GP or therapist if you are concerned about a deeper level of anxiety, panic attacks or depression. This type of challenge should never been seen in isolation if these are challenges that you currently experience. 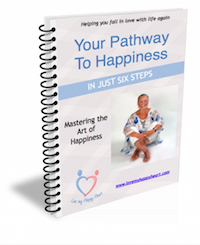 Do you long to be happier? Thank you. Check your email to download your eBook.